Trees fascinate me in the fall. So far I have seen trees that have already changed colors, the leaves have fallen off, and they look like they are ready for winter. There are trees that are right in smack in the middle of that BEAUTIFUL color change and the leaves are just starting to fall. And some trees that are at the beginning stages of turning. It is my reminder that everything happens in due time...when it is ready. I have to remind myself of that A LOT, especially with my business. It is hard starting out...with limited finances and trying to find the best way to get some exposure that doesn't cost a lot. It is hard. But, I will persevere. I will get there. I will keep plugging away and doing the very best I can for every client that I do get. Because they are my most valuable resource. A client that is happy will talk. And I just have to remember.....I will get there. I will get to the place I want to be. It will happen...all in due time. Instructions: Fold kraft cardstock in half to make card base, and adhere a blue paper block to the front. Punch two borders from orange paper and adhere to the top and bottom of a cream cardstock block. Stamp the pumpkin directly to the left side of the cardstock block, and color in the stem with a colored pencil. Tie ribbon around the top, and adhere the entire block to the front of the card. Stamp the pumpkin and leaves to patterned papers and cut out. Piece together on the card, and accent with jewels. 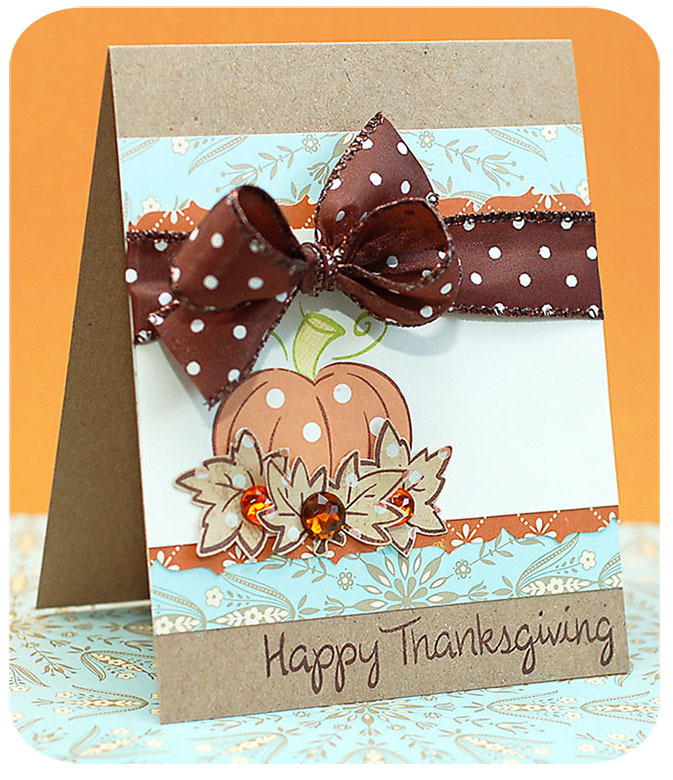 Finish by stamping the sentiment to the bottom of the card. I haven't shared any movies or such with you lately. So, today I am going to leave you with a song from the Eclipse soundtrack that I keep wanting to play over and over on my iTunes playlist. Love it! Lea, your blog is fabulous!! I love your cardmaking style. Lea, this is sooooo gorgeous...love those papers you used, the stamps are fun and that ribbon is gorgeous! Enjoy the pretty fall...love to see the trees changing colors, too. Hugs.. This is a great card. The kraft paper works perfectly with fall. Best of luck with your business! Absolutely stunning card! I just love it! I also love what you said about turning leaves and things happening in time. I can't tell you how much I needed to hear something like that. Lots of love and hugs to you for the inspiration! I am absolutely LOVING this card!! The color combo and that bow!! YUM! This card is simply perfect! This is really a beauty, Lea! Love that fab color combo! Oh I saw this yesterday on Kelly's blog and it's so cute!